Weddings have become synonymous with beautiful cars and at Prestige Carriages London, we strive to provide the finest wedding car hire experience. Whether you need the latest Rolls-Royce, a ‘vintage classic’ or a luxury stretch limousine, we’re sure to have the perfect wedding car for you. The best cars, professional drivers coupled with the best rates make us the only choice for your wedding car hire needs. Our service and reputation is second to none. Don’t just take our word for it- read the countless reviews and testimonials from our satisfied clients. 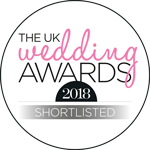 We have also been nominated as the ‘Best Wedding Transport Company’ in the 2018 UK Wedding Awards! We’re all about attention to detail; from the maintenance of our cars to the professionalism of our drivers you can rest assured that when it comes to transportation on your big day, you are in safe hands. Ribbons, bows and even personalised number plates can also be provided – just let us know when making your enquiry. Prestige Carriages London is a member of the NAWCP (National Association of Wedding Car Professionals) which means we adhere to the highest standards as demanded by the industry experts. If you are looking for a wedding car, whether it’s for a one way drop-off to your reception or a full day hire, give us a call and our dedicated team will help you find the perfect wedding transport package for you.